Except for the accent, this guy reminds me so much of my step-brother Patrick. He was always doing wildly insane but pretty cool crap like this. Needed a chuckle, after being subject to more abuses of the medical-test variety this morning. Just a CAT scan trying to sort out the ongoing pleuritic pain, so nothing to worry about. Still, having to stay off coffee until after the test was annoying, and the above vid helped. Last week, there was an interesting discussion on MetaFilter about “Every Day Carry” – both the blog, and the mindset. I was a bit surprised at how dismissive people were of the need to think of basic preparedness, but then I’ve long been of a mind that having some options at hand in terms of tools and resources is better than just trusting to fate. It’s a bit long, but the summation is that Jim Berkland predicted that there would be a major seismic event in southern California sometime in the week of March 19 through March 26. Following the Japanese quake/tsunami from earlier in the month, it understandably got a lot of attention and generated no small amount of fear and anxiety. I heard about the prediction from a number of friends, and it was a major source of chatter in a variety of different forums & social media outlets. A lot of people started thinking about what they should do to prepare for a possible catastrophe. Well, the 26th has come and gone, and there’s been no major earthquake. Of course, no one is talking about that – it isn’t news. Earthquakes don’t happen all the time. And I would bet that a large number of the people who started giving some thought to emergency preparedness the week before have since moved on to thinking about other things. Life’s busy, after all. We had a bunch of friends in for the weekend, a reunion of sorts. It was a lot of fun, and good to reconnect with folks we had somewhat lost touch with. As things were winding down yesterday, a few of us were just chatting about this and that, and one good friend told the story of what happened to his small Midwestern city in the aftermath of a really nasty ice storm a couple of years ago. Trees collapsed under the weight of the ice, knocking down power lines and blocking streets. He couldn’t get hold of his mom, who lived elsewhere outside of town, so he set out to go check on her. He got to her just fine, using his chainsaw to clear paths through streets as necessary. And she was OK. But along the way he passed a number of houses engulfed in fire – stuff that started small but got out of control because the fire department was delayed by both the number of small fires started and the inability to navigate the streets quickly. Reports later also told of a fair number of people who died from injuries and heart attacks which were normally survivable because ambulances couldn’t get to them. I don’t really have anything profound to say. I guess I’m a bit tired from the weekend festivities, and my mind is sluggish. So no real insights, no real message to pass along which hasn’t been said a million times before. But I wish that stories like the failed prediction from Jim Berkland did more than gin up fear and a short-term scramble to stock up on some emergency supplies. Every time there’s a hurricane, there are stories of stores in the area being stripped of almost everything. Same thing has happened throughout large parts of Japan, in the wake of the tsunami and ongoing problems with the Fukushima Dai-ichi nuclear power plant. It’s relatively easy to build a reserve of food and water, to secure necessary emergency supplies – so long as it isn’t something you suddenly need to do when everyone else is also in a panic. Think about it. Then actually do something about it. Lights in the sky. Strange lights. Lights that don’t move . . . right. Must be aliens, stopping off for a visit, right? Highbeams Of The Gods: Do UFOs Need Headlights? Yeah. Good point. Are the aliens scared of running into a deer? Pretty much the most crucial plot point in Communion of Dreams is that the alien artifact discovered on Titan is using some kind of stealth technology. (I’m not giving anything away by saying this, for those who haven’t yet read the book.) How and more importantly why this is the case is what drives the story. It’s even got a flying car on the cover! That is the core message of Michio Kaku’s “Physics of the Future.” Despite its title, the book is not so much about physics as it is about gadgets and technology, described by Mr. Kaku—professor, blogger and television host—on a wide-ranging tour of what to expect from technological progress over the next century or so. Much of the terrain Mr. Kaku surveys will be familiar to futurists, but less technically oriented readers are likely to find it fascinating—and related with commendable clarity. The changes that Mr. Kaku expects range from the readily foreseeable to the considerably more esoteric. Hmm . . . sound familiar? This is exactly the sort of tech I stipulate as being pretty mature (completely developed and integrated into everyday use) in Communion of Dreams. Fun. I may have to get a copy of that book. A different story out of Libya. Small in size at 80 x 50 km (50 x 30 mi), Dar al Gani is the most important Saharan strewnfield, with nearly a thousand itemized meteorites, Lunar and Martian rocks, various achondrites, etc. At least 150 different falls are represented. When you approach Dar al Gani from the west, the first thing to strike you is its whiteness, as if you were looking out over mountain-tops covered in snow: a mirage in the desert. First comes a succession of terraces which then open on to a smooth, rolling expanse of white, without rocks or vegetation. Meteorites have been falling here for thousands of years, and it goes without saying that strewnfields like this one are of scientific interest. Unlike Antarctica, where ice shifts concentrate meteorites and wind scatters the fragments, things here stay in the same place from one millennium to the next. I often think of Dar al Gani as a photographic plate recording all falls over a significant time-scale of 20,000 years or more. The terrain is gentle and preserving, so that thousands of years worth of data are at present accessible. The author and his brother make one of the most important finds ever. Very cool, and with some great pictures. Scalzi’s website contains complete information, and you should read it – Scalzi knows what he is talking about, and has been having these arguments for the better part of a decade that I’m aware of (I follow his blog, and see him discussing these issues on other forums, such as MetaFilter). That said, just because he knows what he is talking about doesn’t mean that he is *always* right, nor that his position is a simple black/white one on the topic. He’s too thoughtful and nuanced for that. 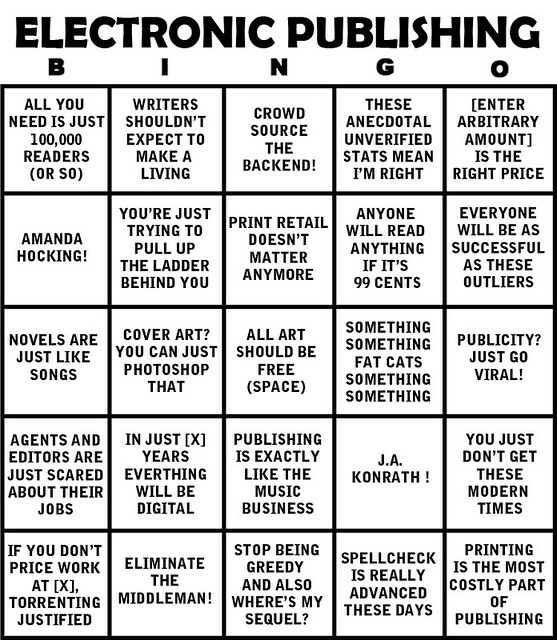 When I voted to go the self-publishing/e-publishing route with our care-giving memoir, I did so fully aware of all the pros and cons (in large part thanks to discussions I’ve seen with Scalzi.) What he says is valid, but I find myself saying “yeah, but . . . ” as pertains to Her Final Year, largely because the care-giving memoir is a niche market, and therefore many of the problems with publishing are more manageable than they are for general or genre fiction. But we’ll see. I’ll be asking for your help to beat the odds. Been a busy few days. Got through close editing (formatting, typos, similar such) of both Her Final Year and His First Year, all except one chapter which needed more work from my co-author and his wife to tighten up some passage. I’m still waiting to hear back from the ‘beta readers‘ whether there are major problems from their perspective, but I am generally very pleased with the book(s). Why the (s)? Because we still need to decide whether we will offer an e-book version which has the two together as the only option, or whether we’ll offer the two titles separately with a discount incentive to buy both. Any thoughts on this would be welcome. Well, was just taking a break from getting some much-needed yardwork done, thought I should post an update. Not much else to tell, though I always seem to find things to post on facebook.